Summer vacations and holiday celebrations can take a toll on workplace productivity. Employee downtime doesn’t have to mean losing business momentum. Employee absence management can keep your business running smooth. Around this time each year, management starts to worry about the impact of vacations. Employees are starting to talk about taking time off and the schedule is in peril. Supervisors are on alert, managers are on edge, and owners are showing concern. Don’t Panic. It’s all going to be OK. Employee absence management strategy can help you reduce the impact. A few best practices and capable workforce management software (WFM) are all you need. There’s a tug of war between management and employees during vacation season. Employees need some time off and want to take advantage of school schedules and good weather. Managers see competitive opportunity in the heart of the sowing season. The Society for Human Resource Management (SHRM) conducted a vacation survey. They asked managers to report on employee time off and productivity. The survey revealed that employees who use vacation time are more productive. Employees who take scheduled time off also enjoy higher morale. Companies that encourage planned time off report higher performance and improved employee wellness. Companies with strategic absence management also report higher employee retention. So, while it may be tempting to keep your employees knee deep in elbow grease, it pays to give them a break. Finding the right balance is key, but don’t be afraid to give employees scheduled time off; they need it, and so do you. Paid time off (PTO), vacation time, and holidays should be a matter of company policy. PTO policy should be part of your employee onboarding program. Include PTO policy in your employee handbook, and discuss key points in orientation. Quarterly reviews are a good time to discuss planned PTO. Your review process should include employee absence management discussions with your employees. Use quarterly reviews to chart future plans and confirm planned time off. Employee absence management demands vigilance from managers, especially during seasonal high tide. Summer months, winter holidays, and three-day weekends are all events to watch for. Survey your employees well before holidays to get a sense of how they will impact your schedule. Start the conversation early and keep it going through the year. 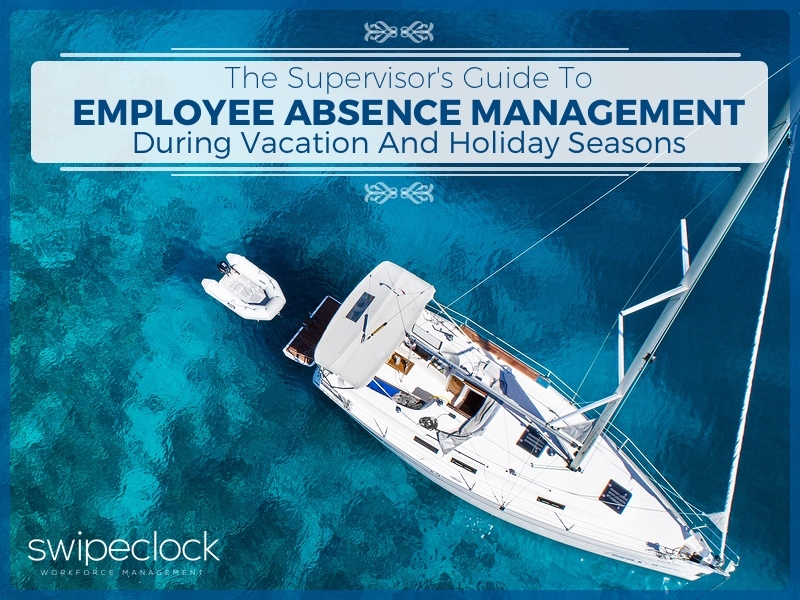 Maintain an open dialogue with your employees as part of an absence management plan. Create a culture of planning and train employees to schedule time off in advance. Companies that schedule more than two weeks in advance have higher employee morale. The further out ahead you can post a schedule, the happier your employees will be. Managers procrastinate scheduling because they think there will be new information to consider. A study conducted by Lambert and Henly found the opposite is true. They found that for almost two-thirds of their schedules, over 80% remained the same from week to week. The fact of the matter is this; you can schedule well in advance and expect very little change. Reduce employee uncertainty by creating shift schedules as far in advance as possible. Employee absence management starts with a good plan and your WFM software. Workforce management scheduling software can help create schedules based on pre-built templates. Templates make it easy to drag-and-drop new schedules and post them as early as possible. WFM software helps lower the work needed to make schedules and helps you get this done quicker. Completed schedules allow employees to plan ahead. With open communication, your schedule will become an effective vacation planning tool. Employees can make adjustments to schedules further ahead. Advanced planning will reduce the impact of change. In the event that last-minute changes occur, and they always do, it’s good to have a solution in place. Employee self-service is a workforce management tool that can help with unplanned changes. Employee self-service allows your employees to submit schedule changes and swap requests. These changes occur in the WFM software. Changes made within the WFM software are subject to overtime alerts and gap warnings. WFM software reduces errors and assures that you maintain qualified coverage. With employee self-service, your employee absence management strategy expands to include employee planning. This will lighten your management burden and build stronger scheduling routines. Employee self-service allows your employees to volunteer for open shifts. This makes a quick turnaround of emergency staffing problems a matter of routine. Employees will be able to plan for far-reaching PTO and can react to short-term shortages. Managers are free from worry and can focus on approvals. Employees enjoy the empowerment of managing their own schedule. Employee absence management is a business strategy. As such, you must work to enforce best practices and build a culture of compliance. When managers and employees share absence management goals, the company benefits. Absence management should be a matter of company policy. It should be an enforced process, and part of the culture of the business. Workforce management software such as SwipeClock WorkforceHUB™ can help enforce absence policy. WorkforceHUB includes advanced scheduling features. It also provides an employee self-service portal that allows for virtual trade boards. WorkforceHUB is an excellent solution for your employee absence management strategy. How Do I Choose Workforce Planning Software For My Small Business? © 2019 SwipeClock Workforce Management.